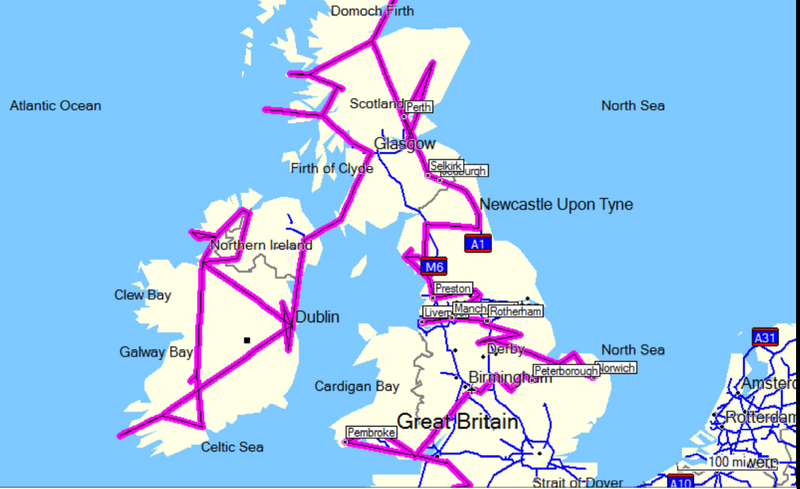 This is a route diagram of my trip through the UK. I travelled over 3200 miles in 12 weeks, not including the trans-Atlantic flight. I estimate that I walked close to 300 miles as well. I took approximately 4500 photos. I visited the following major cities and large towns: Dublin, Bray, Cork, Killarney, Limerick, Adare, Enniskellin, Derry, Sligo, Donegal, Glencolumbkille, Belfast, Stranraer, Glasgow, Helensburgh, Oban, Scarinish, Mallaig, Rum, Fort William, Inverness, Kirkwall, Stromness, Edinburgh, Falkland, Perth, Inverurie, Selkirk, Jedburgh. Newcastle Upon Tyne, Durham, Wreay, Windermere, Ravenglass, Lancaster, Preston, Leeds, Liverpool, Manchester, Rotherham, Sheffield, Lincoln, Cromford, Taverham, Norwich, Peterborough, Leicester, Coventry, Birmingham, Cardiff, Llandybie, Newport, Pembroke, Bath, Salisbury, Exeter, Drewsteignton, Wickham, Portsmouth, Chichester, Brighton, Southsea, Kingston-upon-Thames, and London. When I say visited, I did more than just drive through them. I either stayed overnight or saw something interesting in them. I think that I my plan was executed rather well, though I didn't see everything that I wanted to. I would have liked to have seen Cornwall, Oxford, Cambridge, and more of London. I have been back in the US now for almost 3 weeks and have had some time to reflect back on the journey. It was certainly one of the highlights of my life. What made the trip for me was the fact that the places that I went were for the most part "off the beaten path", and uniquely interesting from my point of view, and the weather was outstanding. I chuckle when I speak to people who said that they "have been to England" and all they have seen is London. Britain is a fantastically diverse place with a huge variety of sights. I could have spent 3 more months there and still have only gotten a sampling of what there is to see. I met many interesting and friendly people as well. Geographically, there were a few places that I thought were exceptionally beautiful: Donegal, Ireland, Devon, England, Orkney and Rum, Scotland. I found beautiful buildings everywhere I went. I did greatly enjoy Cragside in Northumbria, the Granian of Alech in Ireland, Melrose Abbey in Scotland, Pembroke Castle in Wales, the Lowry in Manchester, Bath, England, Hampstead Heath, Highgate and Kensington in London. The best food was in Scotland, particularly the breakfast. The finest women were in Edinburgh. The most friendly people were in rural Ireland, particulary Donegal and Kerry. The most fun driving was in the Lake District in England, and a close second would be the Wicklow Mountains in Ireland. The best pub was in Drewsteignton, Devon, where I had quite a few pints of various local brews including Otter. Ther best cup of tea was at the Inn at Ben Nevis. The most quaint and pleasant room I stayed in was in Orkey at the Mill of Eyreland. The nicest room was either in Inverness (ultra modern) or Glasgow (ultra Georgian). The nicest B&B proprietor had to have been Ian from the Rose Garth in Ravenglass, followed by a close second with Pat from the Globe in Newport, Wales. All in all, the trip was a dream come true and there were very few, if any, negatives.